Fake news on Facebook. Trump's Twitter tantrums. Snapchat Spectacles. Social media delivered plenty of surprises in 2016. For digital advertisers and marketers who've been paying attention, however, the biggest social media trend expected in 2017 shouldn't be surprising at all: live video. Livestreamed video took off on social in 2016, and many believe 2017 will be the year it explodes. Prerecorded video will still have its place, of course, but brands will increasingly use real-time video to engage target audiences during the coming months. Live video will be hot in 2017 because it lets brands engage with audiences in a way that's immediate, unscripted, unedited and more authentic than "canned" content, according to marketers who spoke with CIO.com. "Facebook really brought live video to the mainstream," says Brock Cooper, SEO and social media management coordinator for All Web Promotion, a website development and social media marketing agency. The concept was "too new" in 2016, and brands "were a little afraid to use it because of the lack of control. There's no editing and that makes it real, which is the best thing about it." "Video is going to become the face of business in 2017," says Mike Arce, founder and CEO of Loud Rumor, which provides marketing for fitness studios and gyms. "This means decision makers and CEOs need to start humanizing their companies with videos of real people that others can relate to." 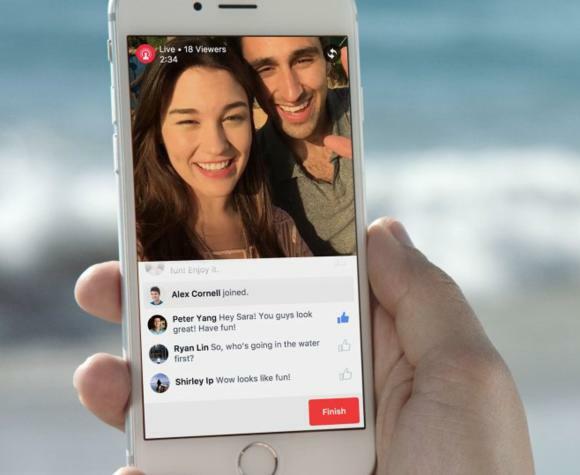 What exactly is live video? Live video is video captured on smartphones, tablets or professional cameras and streamed real-time to the internet, for viewing in mobile apps or on the web. Facebook Live is one example. The feature streams video captured using the Facebook mobile app to users' followers in real time, similar to Instagram's livestream broadcasting. Snapchat also lets users stream live video using a mobile device or — if you're extra cool — the company's hard-to-get Spectacles. The Twitter-owned Periscope, which brands and celebrities have used to offer insider access to award-show red carpets, sports events and fashion shows, also features live video. And the NFL streams its Thursday Night Football games on Twitter in real-time, without the need for a cable TV subscription or Twitter account. Why is live video hot? All kinds of video are popular on the internet today, but live video is perhaps the hottest. Video will be the fastest-growing content category on mobile, desktop and everywhere else through at least 2020, eMarketer.com predicts, and as a result digital-video ad spending will rise from $9.90 billion in 2016 to $28.08 billion in 2020. Cisco estimates that video will account for 82 percent of global internet traffic by 2020, up from 70 percent in 2015. And live video receives three times the amount of engagement than prerecorded video, according to Forrester Research. We posted a query on the Help a Reporter Out (HARO) site, asking digital marketers for their predictions on the biggest social media trends for 2017. Of the 68 responses, nearly every one mentioned the growth of video as among the most important trends. Most respondents also emphasized not just prerecorded video but live, real-time streaming video. Social media platforms such as Facebook will challenge traditional media for ad revenues, according to Heidi Besik, group product marketing manager for Adobe Social. Big television events will be more frequently consumed through "snackable clips" on social media, too, she says. "We'll see brand advertisers begin talking about platforms like Twitter and Facebook as a new form of television. And as consumers get increasingly more comfortable (and familiar) with video, we'll see a shift in organic content where brands begin building out dedicated video teams and putting together an infrastructure that decreases turnaround times and gets content out faster." Brands and content creators will also become more adept at understanding the types of video content that perform best on different platforms, and they will do a better job of engaging consumers with video in 2017, according to Alexa Biale, senior marketing manager at NewsCred, a content marketing platform. "With Instagram's new shoppable tags on photos, it wouldn't be surprising to see shoppable videos appear on Instagram as well, or on other platforms in the near future," Biale says. Consumers will see brands use live video on social platforms to announce news or to "blog," instead of simply posting press releases or traditional text blog posts, according to Maree Jones, a social media and PR specialist with marketing agency Luckie & Co. In 2017, more brands will move dollars from traditional advertising toward social media platforms, which in turn should increase the quality of video and other content types that brands share on social media, according to CC Jacob, art director and social media manager for restaurant group Food Fight. PR professionals should "work closely with social media and digital marketing teams" to leverage live video for company news and press opportunities, Jones says. "Figure out a strategy at the start of the year and experiment with it throughout 2017 to determine if it's worth investing more time and resources towards this style of publishing." Rival IQ, an analytics firm, has used live video for product announcements. In November, the company announced its latest software features via Facebook Live, and the video received more than 660 views to date. However, video announcements aren't right for everyone. For example, one visitor to Rival IQ's Facebook page asked if there was a corresponding webpage that lists the new features, "which will be easier to share with the team, instead of 15 people watching a 40-minute video." The answer: Yes. Rival IQ had wisely also created a blog post to detail the new features. Brands should experiment with video content right away, especially on their Snapchat or Instagram Stories channels, according to Biale. "With those images and video only lasting 24 hours, it allows a casual approach to video production and gives you a low-cost way to experiment with various types of content." Matthew Tyson, a digital marketing strategist with WideNet Consulting, says brands should try to post video every day. "Don't be afraid to get risky, creative, and even a little strange," he says. "Push the boundaries and think outside the box. There's no need to play it safe anymore." You also shouldn't overlook the SEO potential of social media video. Live video can be downloaded and then uploaded to YouTube, which can in turn help them gain a wider audience via Google searches, according to Kate Talbot, a content marketing consultant and author of Oh Snap! You Can Use Snapchat for Business. YouTube also has more than a billion users, and it reaches more people ages 18 to 49 than any U.S. cable network, according to YouTube. Companies should try to be "camera ready" and willing to chat about their products and services, and take the opportunity to position themselves as thought leaders in their space, according to Stephanie St. Martin, brand awareness manager with The Ariel Group. It's also a good idea to anticipate a general distrust of your video metrics. In 2016, Facebook made headlines due to its over-reporting or undercounting metrics related to brands' video views or posts. An "upswing of uncertainty and distrust in social metrics" is expected in 2017, regardless of the content being promoted, according to Lily Croll, strategy director of digital marketing agency Wire Stone. As a result, marketers need to increase their transparency when selecting key performance indicators and be prepared for pushback from C-level executives, Croll says. "Focus on metrics that are tied to business results. Kill off legacy metrics that may make your C-suite feel good but aren't fundamentally driving an impact to the business. Have experienced analysts on staff and make sure you're well-informed independently about social and digital metrics." Companies who don't embrace live video will be left behind, according to The Ariel Group's St. Martin. The upshot is that there are many effective ways to use live video for marketing or outreach. For example, brands should train their social media managers to answer customers' questions and needs on camera in real time. This strategy can help brands appear more transparent and authentic. "People want to see authenticity and transparency and not a scripted response from brands," St. Martin says.